Pittsburgh can turn into a real winter wonderland in December. There is, of course, the snow - but there are also so many fun additions to the city around the holidays. Today's post is going to be a holiday bucket list, of sorts - a guide to fun, temporary events that are happening in the city right now. Each year, Phipps transforms itself after Thanksgiving. They put up beautifully decorated Christmas trees, deck the rest of their halls, and even turn their garden into a holiday wonderland with decorations and light displays. I drive by it on my way home from work every day, but I've never actually been in. I'm planning to check it out this week, and I'm so excited. Market Square hosts a lot of pop-up markets throughout the year, but none more festive than their holiday market. Each booth looks like something straight out of the North Pole, and you can walk around and check some gifts off your Christmas list too. Plus, while you're in the area, you can check out the next two items on my list! Just a few steps from Market Square is PPG Place. The inside of PPG Place turns into a true wintergarden, filled with lots and lots of decorated Christmas trees. Its the perfect place to check out when you need a break from the bitter cold outside. 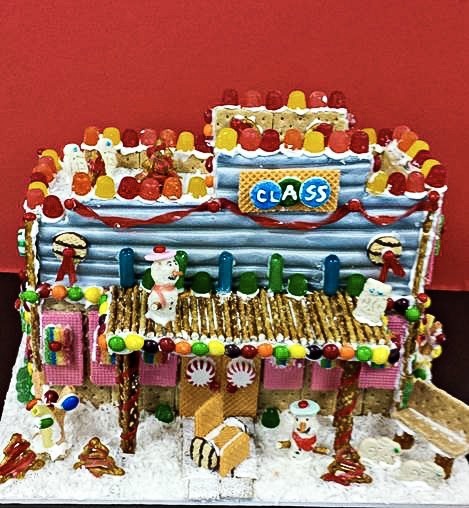 They also have a gingerbread house contest, and this year CLASS (the organization that I sit on the Board of Directors of), took home an award for their entry! Miracle on Market is a pop-up bar, in a new location this year - above the Oyster House in Market Square. The bar is totally decked out in holiday decoration - over-the-top decked out! It's open until New Years Eve, and a portion of the proceeds will be donated to 412 Food Rescue.